My St. Louis MQG recently completed a quilt challenge created by the Member's Swap/Challenge committee. They asked that we create a quilt with a minimum size of 24" x 24"; which in some way used the traditional Ohio Star block. The challenge was to be innovative and somehow make it modern; maybe it's in the fabrics you chose, or maybe you decide to go a little wonky...whatever you do, you must have a complete Ohio Star block somewhere in the quilt. I played around in Illustrator for a while and created the below design. I then spent way too long deciding which colors to choose and actually threw our my first idea (Neon) in favor of my love for scraps...I think it was a wise choice. 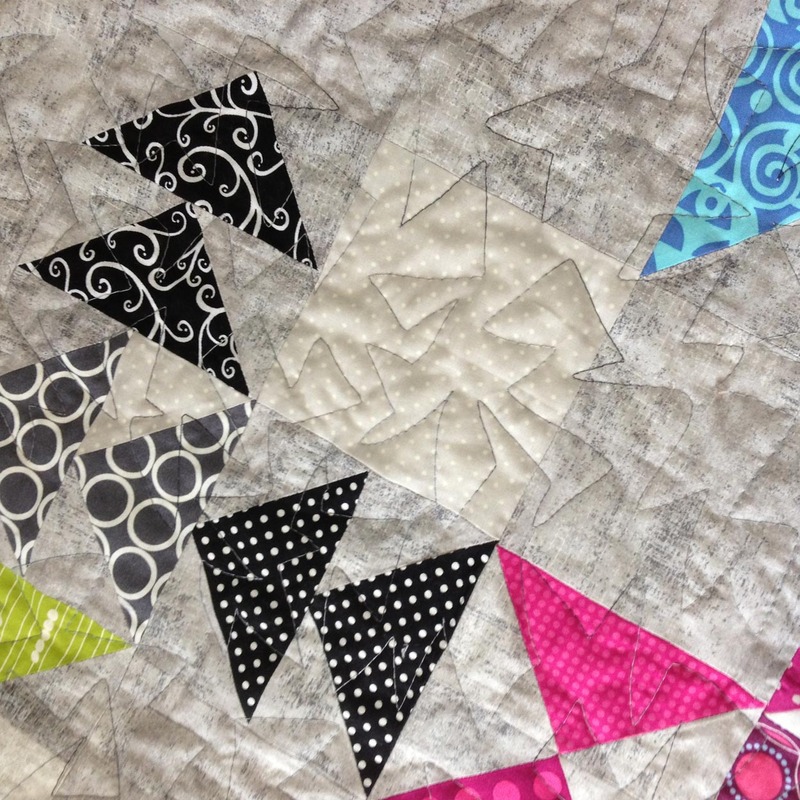 I did a little piecing at home; but the quilt really took shape at one of our Sew-Ins. Once the top was done, I decided to be a little adventurous with the quilting and use a new to me thread; which I had bought from a vendor while at QuiltCon in February. It's a variegated grey 100% cotton thread from YLI. I was hesitate for a few reasons. 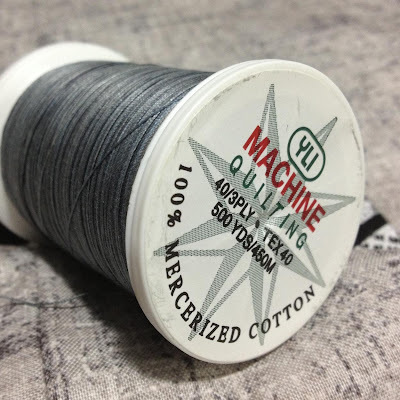 First, it was 100% cotton and while my fabric is always cotton, my thread is always poly. 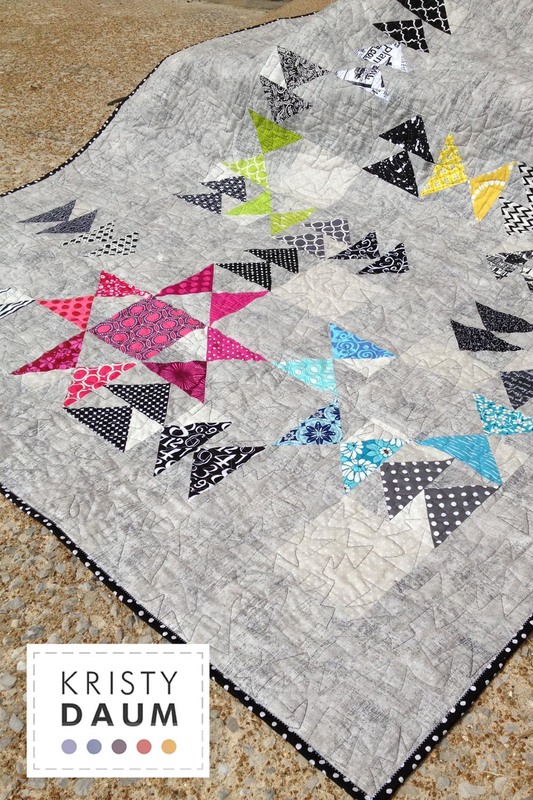 Second, it was variegated and I didn't know how that would actually translate on the quilt. Third, it was a tad thicker then I was used to. I put it on the machine, got out my free-motion quilting gloves and went to town. Can I tell you, I'm glad that I took the chance, as I'm very pleased with the result. The variegation worked beautifully with my subtle background choices. 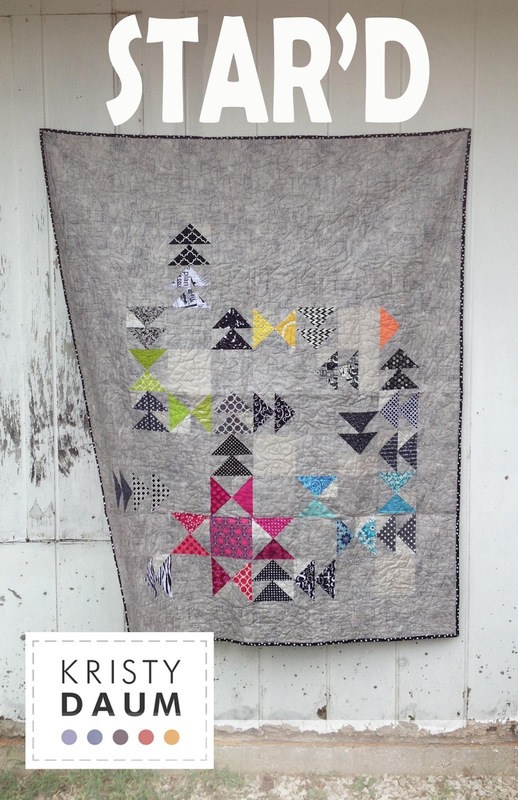 I have to be honest, I'm IN LOVE with this quilt. Seriously, IN LOVE...it is hands down one of my favorites. While it might look deceptively complex, it went together so easily that I decided to write up a pattern for it; which you can find on Etsy or Craftsy. Quilt Measurements: 50" x 60"
Fabrics Used: Background is two shades of Burnish from Adorn It, and one subtle polka dot print picked up at my local quilt shop. All of the rest of the fabrics, black/white and the color pops are all from my stash. Sorry STLMQG...I couldn't hold out any longer, I tried, I really did. It's been killing me that I couldn't blog about this for such a long time. Please forgive me. 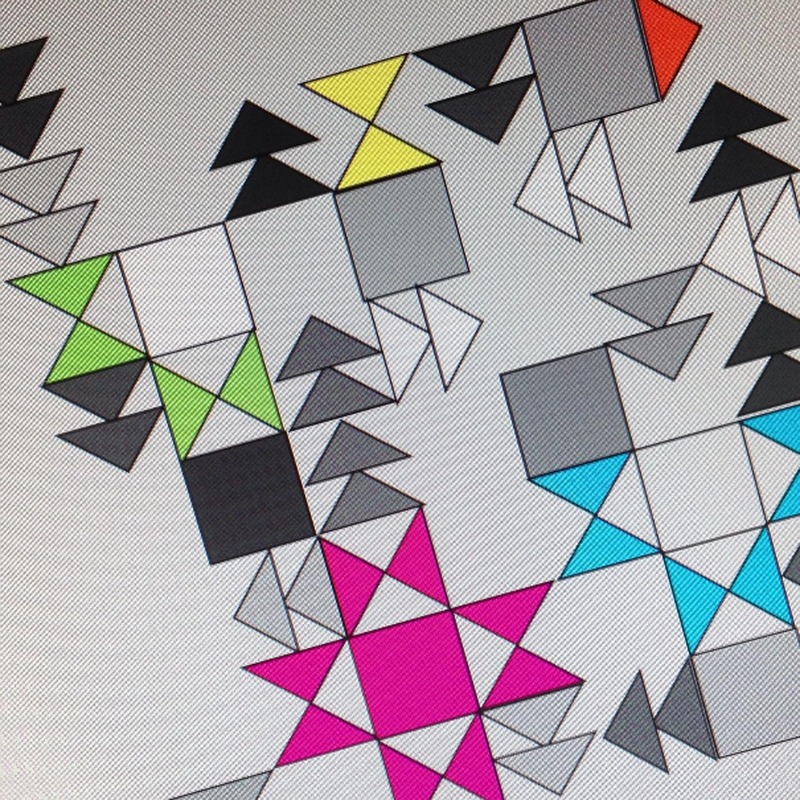 **This pattern was amended on 5/18/14. If your copy says 3 1/2" x 3 1/2" it actually is 3" x 3". And if you copy says 3 1/2" x 5 1/2" it actually is 3" x 5 1/2". 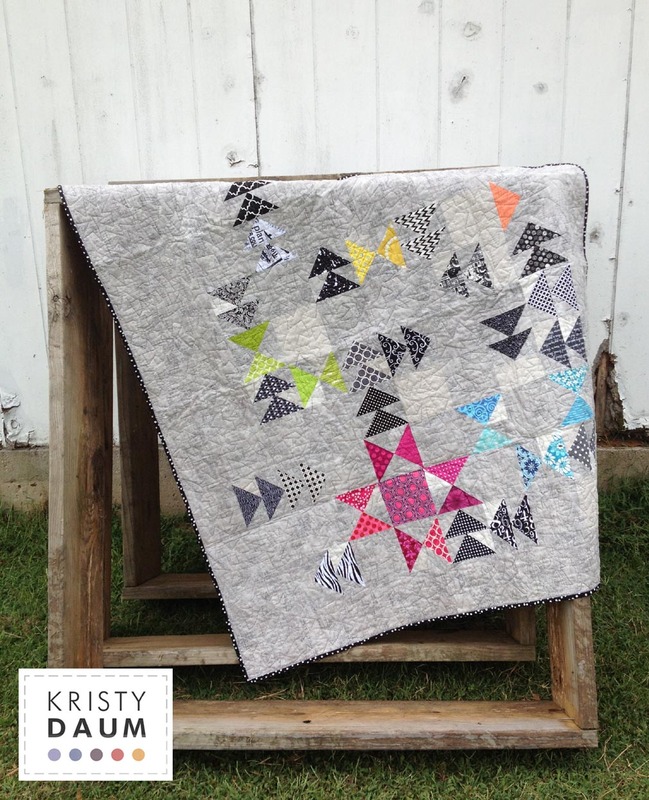 What a great new quilt pattern, Kristy! 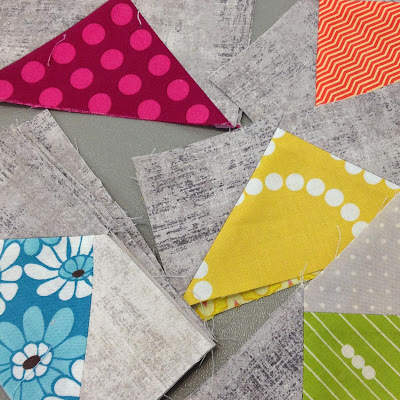 Lisa showed the U-Turn (I think that's the name) quilt tonight at KCMQG....so fun! it's fabulous! I love the variegated thread - it's the perfect touch. Love it!! And can't wait to see it in person! So pretty, I love your background fabric. it adds so much! It's wonderful! Great backgrounds and greys with the color. This turned out so great! I love that my brain automatically tries to assemble another complete Ohio star from the colored bits, but can't. This will look great in SO MANY colorways/styles. Nice work!